The 2018 World Ball Hockey Federation (WBHF) 3-on-3 and Master’s tournament has completed, and we couldn’t be happier with the effort put forward by the players of Team Great Britain. They were up against some stiff competition, but they left it all on the floor, and came home with some new hardware to show for it! 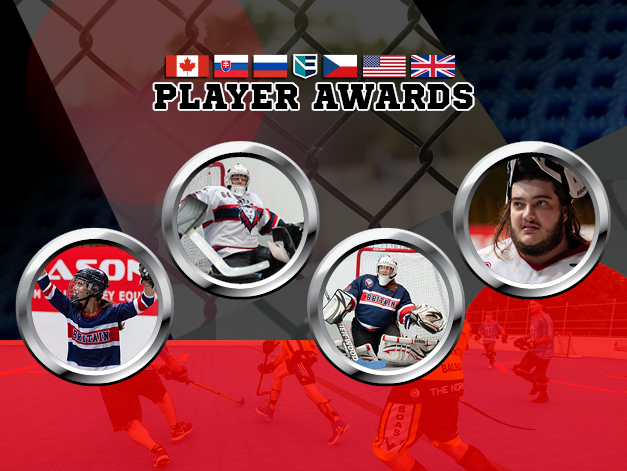 The following Team Great Britain players were awarded accolades for their excellent play during the tournament. Darla Dupuis (#7) was added to the women’s All-Star team thanks to her agility and accuracy on the floor. Darla was also awarded Team Great Britain’s Forever Homes Inc. Player of the Game, and Fire Monitoring of Canada’s Hot Shot award multiple times over the course of the tournament. Kayla Horney (#29) took everything that was thrown at her in stride. She was standing on her head for the entirety of the tournament, which is what got her recognized as the top women’s goalie in the tournament! Kayla also won the Forever Homes Inc. Player of the Game award on November 14th. Kayla normally plays at BHi Brantford. Trevor Van Dyk (#64) has immense skill as a goalie and was recognized for it by being named the Master’s division’s Top Goalie. Trevor also earned the Forever Homes Inc. Player of the Game award on the first day of the tournament. Jackson Roberts (#70) was added to the men’s All-Star team because of his incredible prowess as a goalie. There’s no denying the onslaught of shots being taken at him during the tournament, and he was able to roll with the punches. He was also awarded the Forever Homes inc. Player of the Game award on November 13th. Team Great Britain played their hearts out during the 3-on-3 and Master’s division of the WBHF tournament, and it’s heartening to see some recognition for the players’ hard work. We can’t wait to watch them hit the floor and bring it even harder the next time around!